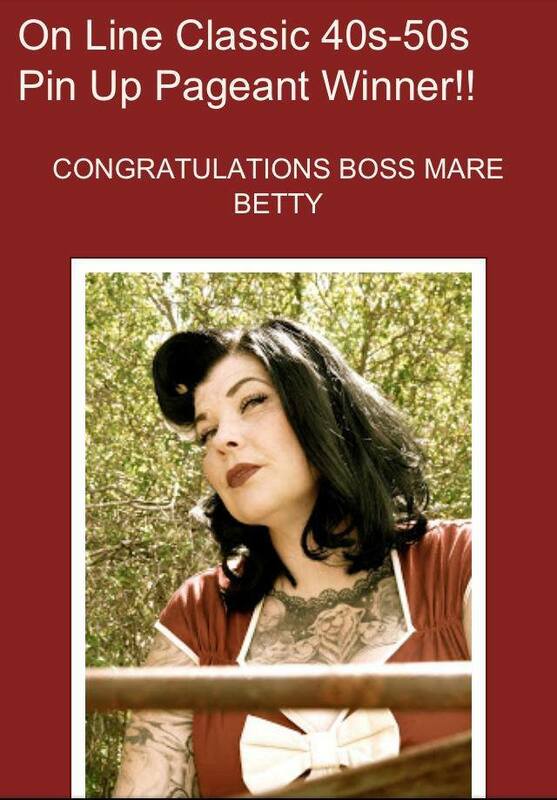 Betty has been taking me on some new and exciting adventures I could not have dreamt of over the past few years. 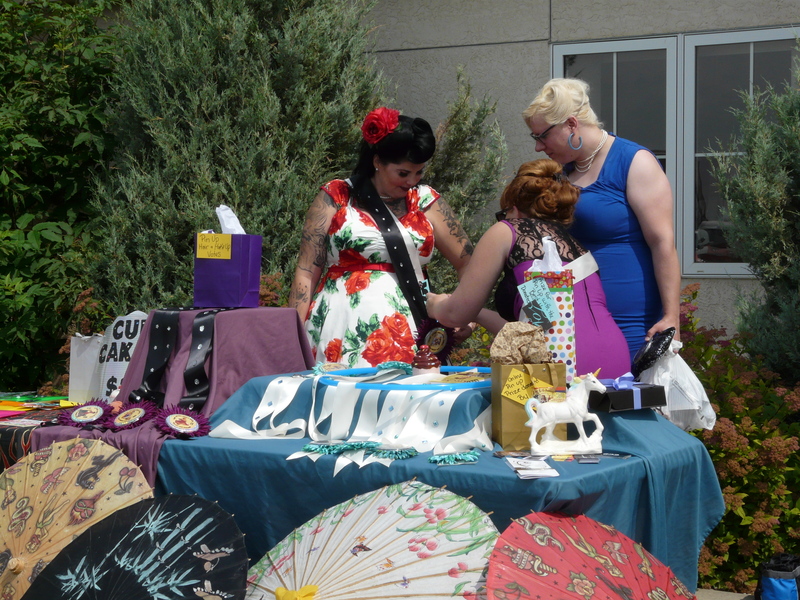 With my interest in writing my perspective on events I was excited when I came across the REVREV Revival and Pin-Up Pageant as this would be my opportunity to document something new. I had a very clear intention to want to write about the day’s events and especially about the ladies that would be entering the Pageant. Who knew I would end up entering the contest myself. After a photo shoot with the D.I.V.CO in the backyard by Coca and a lot of encouragement by my family I was going to be surrendering to this experience and figured no matter what at least I put myself out there. As I am out on a farm and a bit of a recluse, BmB’s personality is that we are front and centre on-line yet in the physical world I have a hard time putting myself out there. I would never imagine what was to come, as soon as I started posting my pictures with links to the on-line portion of the contest you all stepped up and really put me in a position that was unbelievable. Everyday my numbers grew steadily and my heart softened and my personal walls began to weaken. This was a big trip for us, we had to consider our farm before we left and it was the first time in three years we had all left the farm together on Vacation. The drive down to Edmonton was smooth running and our first day we hit our regular spots LG Kustoms to see Pandora and Betsy. 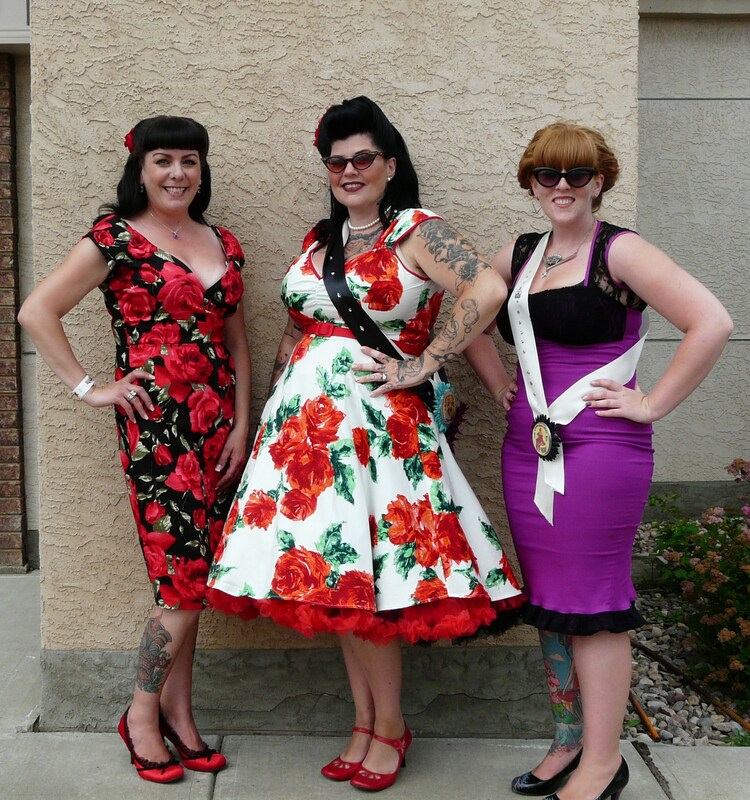 In the afternoon we went downtown Whyte Ave so Coca and I could have girl time in Rowena’s. 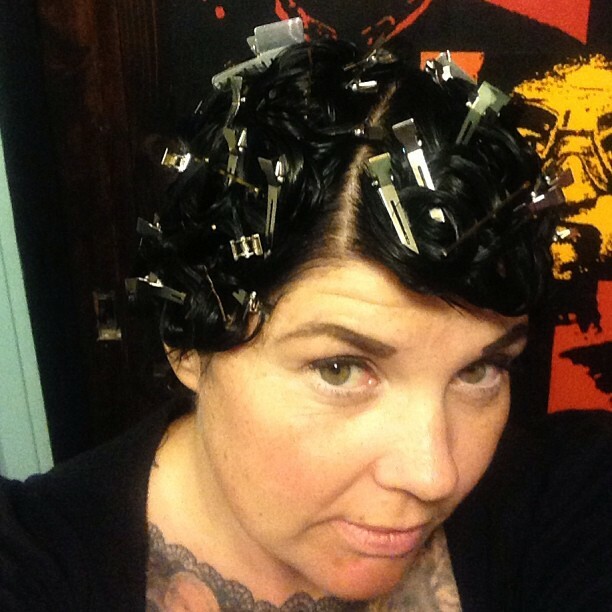 That night I went to the Honey Dome to have my hair pin curled in preparation for MUAH the following morning. It was a full long day and the Pageant was fast approaching. 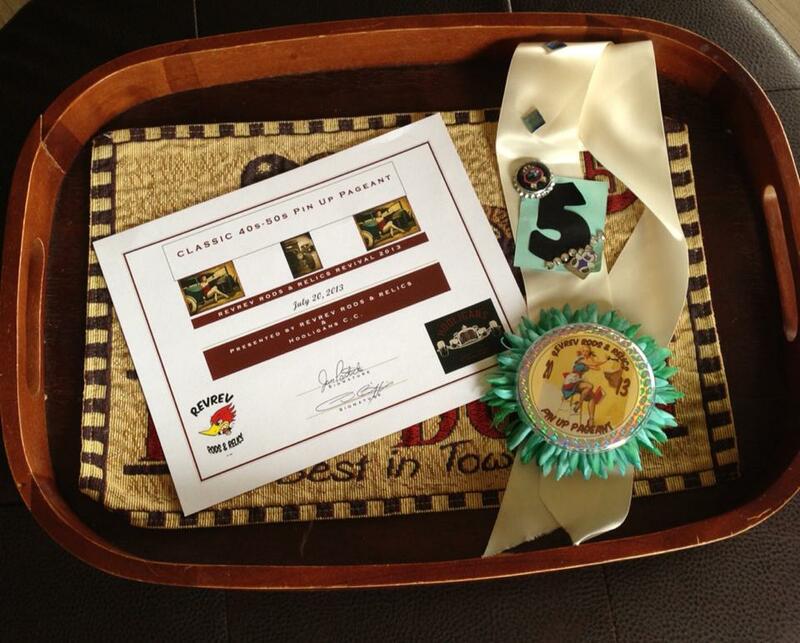 By the time we had gotten back to the hotel the on-line winner was announced and it was official I had won it. Sitting under a hood dryer I reflected over the past month and all the encouraging words you gave me, it was time for change. In the morning and after receiving the most amazing hair I could have ever received by Julia Owner of the Honey Dome we made our way our to the Revival. In our typical fashion we got lost doubting our instinct for direction yet eventually made it, a little late yet we still arrived. Upon getting out of the truck I took a very deep breathe, I told myself that it was time, it was OK and that I was going to own what you all saw in me. As I walked across the parking way I emerged from with in myself and had the confidence to see through this day. 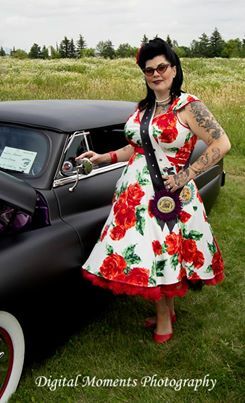 After changing outfits I was presented with two sashes by the gorgeous Kortney LovesAlot Miss Hot Rod Hooligan 2012. 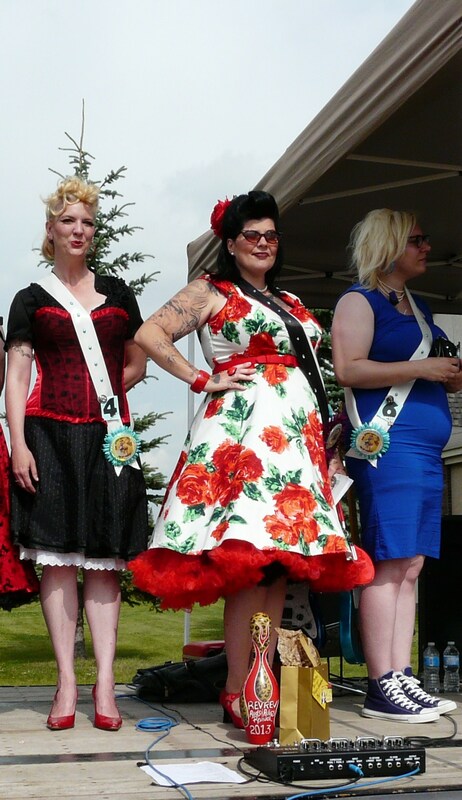 One was for being a participant of the Pageant and I wore the #5 and the other a black with purple flower because I was the “On-Line” winner. I knew I was going to have to pick a vehicle to receive the Hot Legs Award and so I set forth, my notebook and pen I was on a mission. I approached as many people that I could that were sitting by their vehicles, I had great chats about vehicle makes and models, are they driven, where did they live, so and so forth and as I went along, it got easier. I was then approached by a young girl, sheepishly she touched my arm and asked if I would come to her parents vehicle to take pictures and it was in that moment I saw all of this experience through different eyes. I don’t look back into my childhood often and yet I had a very clear feeling/ memory of being that age, being smitten by someone that I saw being in the public eye and then taking the time to ‘see’ me. As I approached the vehicle I bent over and took the time to talk to her, I asked if she would hold my purse and I gave her a sticker that I had hidden in my purse. I knew then I had found that side of myself again. I went on to find my Hot Legs winner after a great conversation with he and his wife, we had a good chuckle that I recognized the curb feelers and was asked by Digital Moments Photography to take a photo with the said car..! Shortly after us Pageant girls were asked to go on stage to help call out numbers for the Door Prizes. At that moment I figured if there was a time I might die that was it once I realized I might just keel over and die, specially once seeing the girls in front of me talking into a microphone..! As my turn came I remembered Julia’s advice from the Honey Dome and so I took the microphone in my hand and slightly braced myself in anticipation of hearing my own voice and before I knew it numbers were being announced and I was still standing. 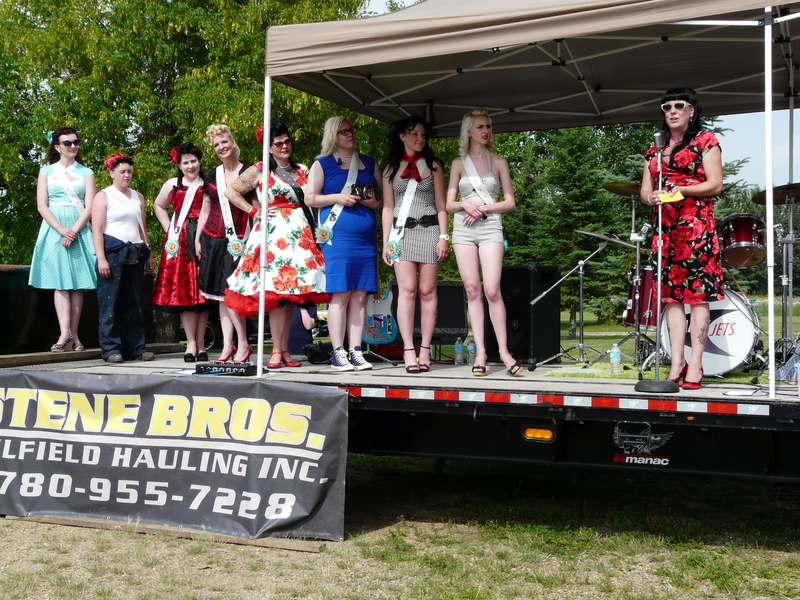 After a bit of a break we were called back on stage to do the Pageant. It was all or nothing yet I was calmly comfortable as I was so happy with my sashes I had no expectations from that point on. 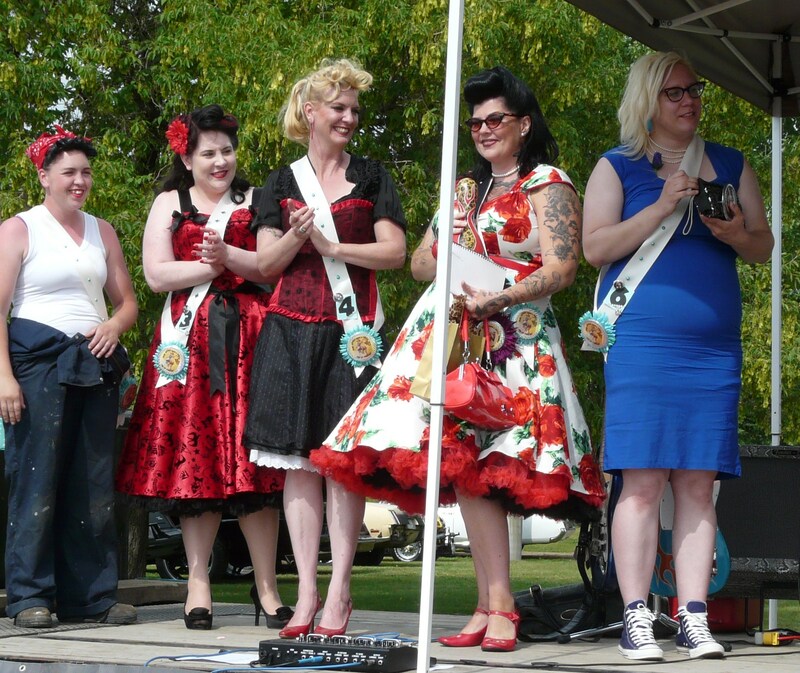 The MC’s were Kortney LovesAlot Miss Hot Rod Hooligan 2012 and First Runner up Paula. These two brought immediate ease between their jokes and banter and I almost forgot I was on stage. 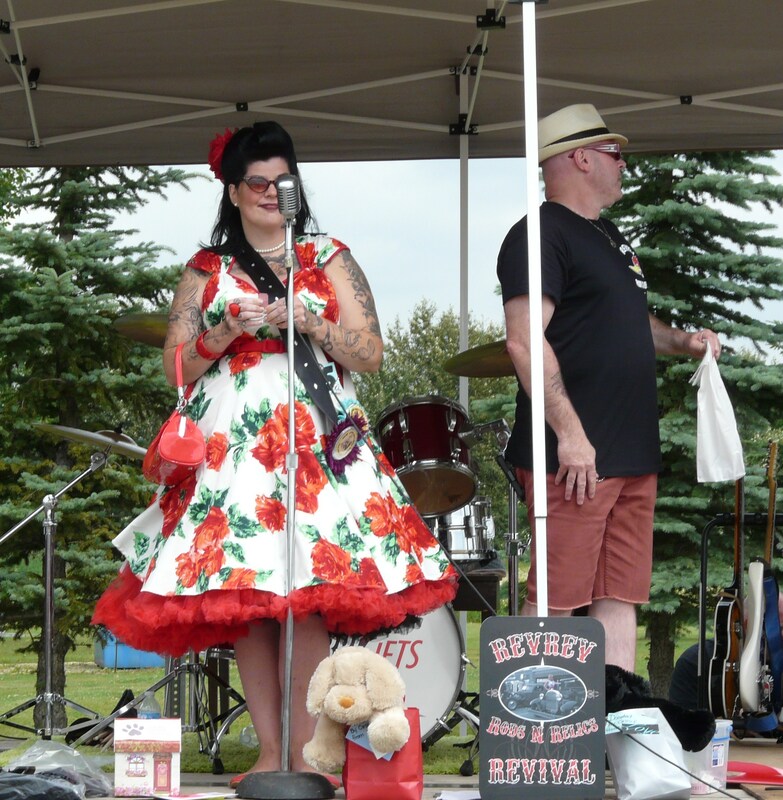 Paula has such a graceful and natural way of being on the stage and talking, with such ease she talked about the Stollery Children’s Foundation in which the Revival supports through donations and auctions. As we the contestants were standing in line in the order we arrived Paula brought forth each girl asking questions or saying a something interesting or fact about the girl to keep the crowd entertained. As we were driving home and really reflecting on the day I came to realise something about what Paula had said about me. I don’t think to often we get to really hear what others think or perceive of you, we may think up stuff on our own or hear stuff second hand, yet to actually hear her words and speaking so highly of me I nearly came to tears right there on that stage. 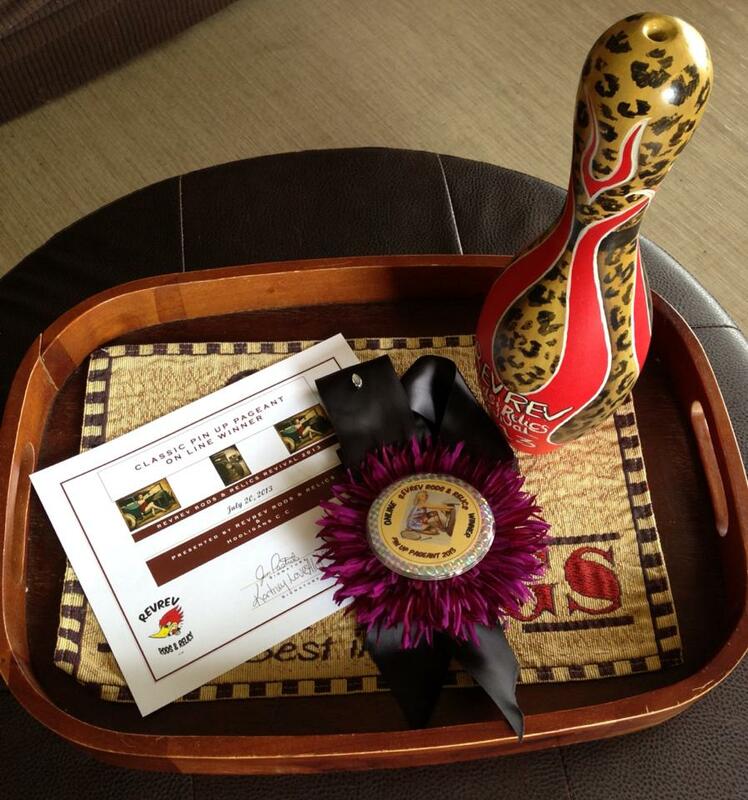 I received a very cool VERY custom hand painted leopard and red flamed bowling pin Trophy for the On-line contest and I even won an award for Best Hair..! I was thrilled to call out Dave Bordman’s name for his Hot Legs Award and his reaction was the best..! This will be a day I will not forget, Thank you..! A BIG Thanks to the Hooligans Car Club for hosting the Revival, there were a lot of man hours put into this event and you could tell a lot of time and consideration because everything ran smoothly and with out a hitch..!! 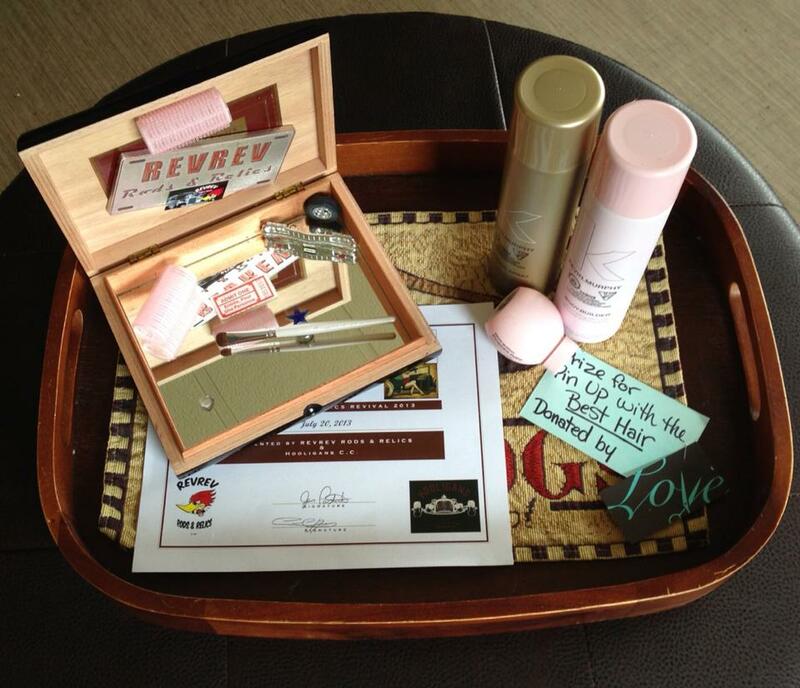 Thank you to Rowena’s for the gifts I received for winning On-line winner..! 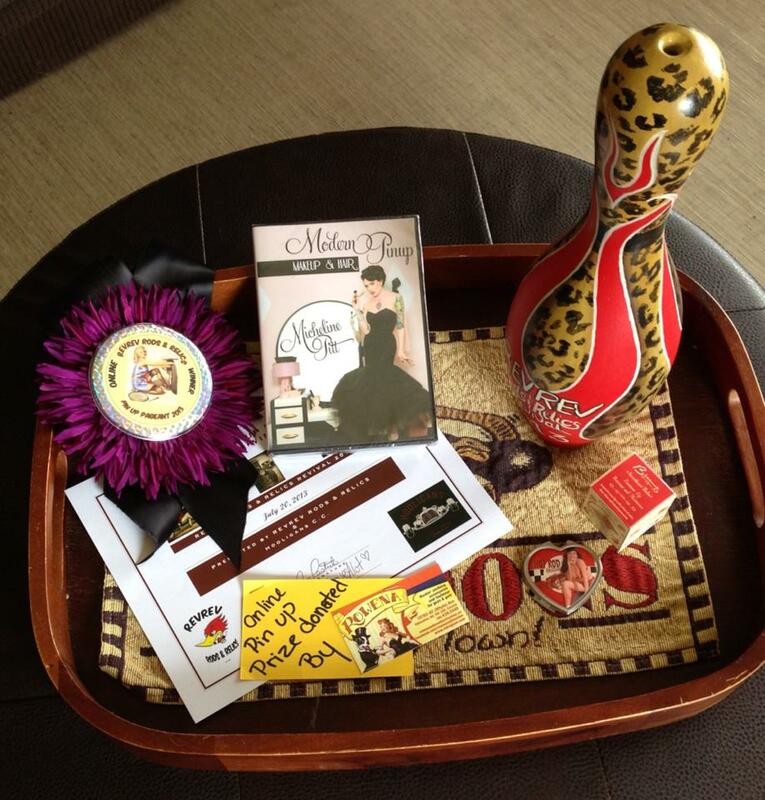 The prize included Modern Pinup Make up and Hair DVD by Micheline Pitt (EeeeK..!) A Besame cosmetic and Betti Page compact. Rowena’s is located on Whyte Ave Downtown Edmonton and is your one stop shop for anything unique and Pin-up catering to Kats and Kittens. Award for Best Hair and Gifts. 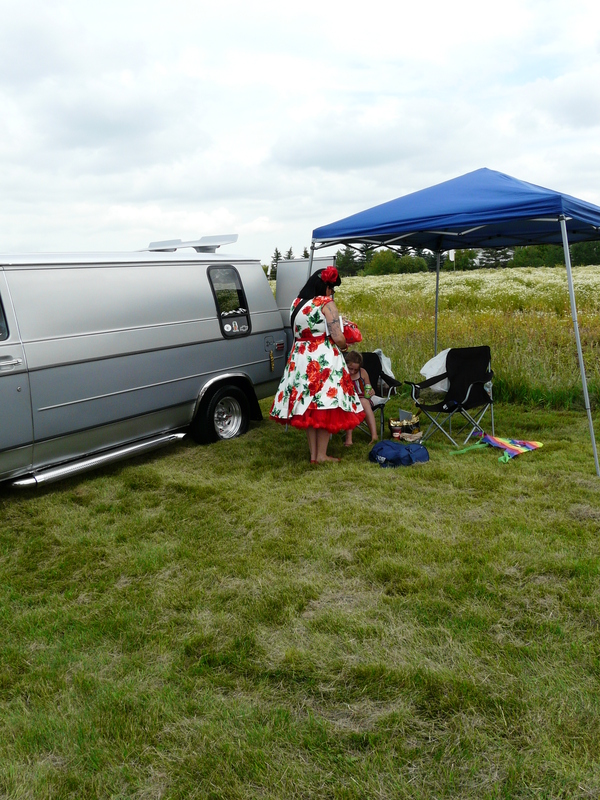 Such a great day and I look forward to bringing Betsy along for the 2014 Revival..!